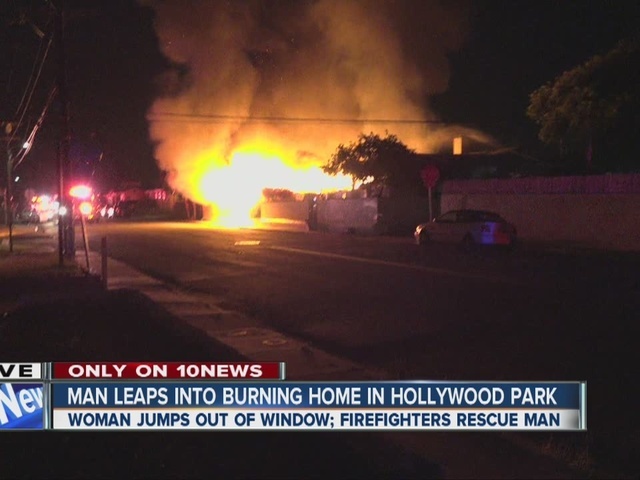 SAN DIEGO – A woman had to jump from a window during a raging fire at a City Heights home in the early morning hours Wednesday. The blaze broke out before 1:20 a.m. at a one-story home at 25647 Violet St., near Hollywood Park. According to San Diego Fire-Rescue, people were still inside when firefighters arrived on scene to find flames shooting from the home. San Diego police officers jumped a fence trying to get inside. One woman tumbled out of a first window to escape the blaze, while firefighters pulled a man out of another window. He gasped for air as they helped him into the street and away from the flames. As crews were responding, one man realized his roommates were missing. A 10News camera was rolling as he crawled back inside through a window to try and find them. Several people were rescued from the home by firefighters, SDFR said. No one was transported to the hospital and there were no serious injuries. Investigators are unsure if all the people inside were residents. SDFR reports that the fire likely started in a carport and swimming pool that is in the front yard of the home, but then spread to the main structure. It took crews about 30 minutes to bring it under control. The damage from the fire is estimated at $300,000. The cause is under investigation.